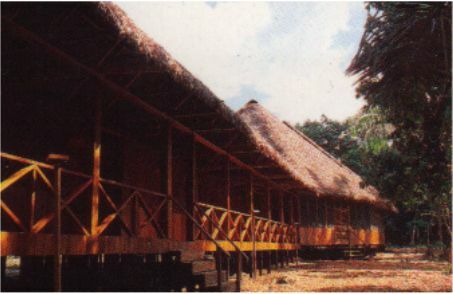 Our lodge lies within the Tambopata-Madidi reserve areas of Peru and Bolivia. 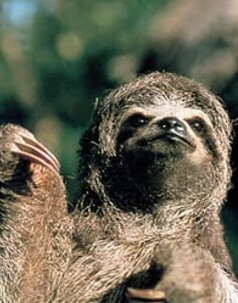 Bolivia’s Madidi National Park totals 18,900 sq. km./7,297 sq. miles, while the adjacent reserves of Tambopata-Candamo and Bahuaja-Sonene across the border in Peru add up to more than 13,700 sq. km./5,290 sq. miles. Taken together, they form the second largest, and by far the most biologically diverse nature conservation area in all of South America. 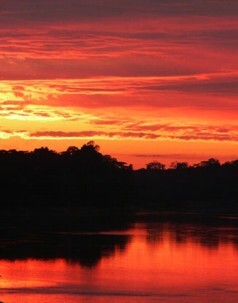 Today we make an early start to visit the lodge’s most spectacular feature: the Heath River parrot and macaw lick. 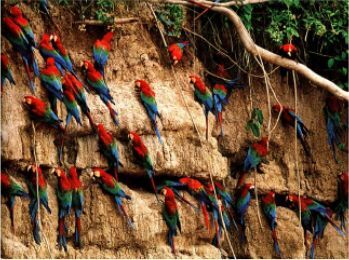 Here these colorful birds gather to eat a type of clay from the cliff-like river banks that neutralizes certain toxins in their diet. They congregate early each morning, sometimes by the hundreds, jostling and squabbling over the best eating spots on the clay lick. This noisy and unforgettable show can go on for two or three hours, and may begin with up to five species of parrot and two varieties of parakeet, followed by Chestnut-fronted Macaws and their larger, more boisterous cousins, the Red-and-green Macaws. This extraordinary wildlife display occurs at only a handful of sites in the Upper Amazon Basin, and nowhere else on the planet. Our floating hide platform provides comfort and complete concealment, so that we can eat a full breakfast here during pauses in the bankside spectacle. For ultra-close-up viewing, our guides carry a tripod-mounted spotting scope, which can also be used to get telephoto pictures with even the simplest camera. On our return we can land partway downriver and walk back along a section of the lodge’s extensive network of forest trails. We encounter numerous gigantic Brazil-nut, kapok and fig trees, along with the scary strangler fig, whose life strategy is as sinister as its name suggests. Our guide will point out and explain the medicinal and commercial uses of dozens of plants and trees, while we keep our eyes and ears open for birds, or one of the eight species of monkeys found in this region. We might come upon a small herd of White-lipped or Collared peccary – two kinds of wild pig that are quite common in this area. For purposes of territorial marking they deploy a “stink gland” so potent that they are often smelled long before they are seen. After lunch we typically hike or bicycle along a major trail to a point where the forest abruptly gives way to the spacious plains of the Pampas del Heath, part of Bolivia’s Madidi National Park. This unique environment -- the result of very poor soils, plus an extreme seasonal cycle of dryness and flooding -- is the largest remaining undisturbed tropical savannah in the Amazon, and is home to rare endemic birds and mammals, such as the Swallow-tailed Hummingbird and the highly endangered Maned Wolf. Shortly beyond the edge of the forest we can climb a raised platform that allows us a grand view of this vast expanse of grassland and shrub, studded with palm trees. We can continue another hour or so to a swampy area thick with Mauritia flexuosa palm trees, whose oil-rich palm nuts and hollowed-out dead palms provide vitally important food and shelter for nesting pairs of Red-bellied and increasingly rare Blue-and-yellow macaws. We aim to arrive toward dusk, when the macaws are returning from their day’s foraging to congregate in this very special breeding site. We return to the lodge by night, using our flashlights, and perhaps pausing here and there in total darkness, to listen to the ever-changing orchestra of animals, frogs and insects, and to experience the magic of the night-time rainforest. We may come upon such bizarre nocturnal creatures as camouflaged frogs disguised as dead leaves, toads the size of rabbits, hairy tarantulas peering out of their dirt holes, night monkeys lurking among the tree branches, and a seemingly unpredictable array of other nightlife. Our second full day at the lodge allows us to choose from a wide range of activities available in this exceptionally diverse tropical environment. 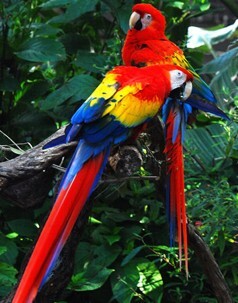 Many people choose to make a second visit to the macaw clay lick. 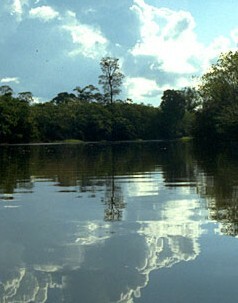 Later we can take a canoe tour around Cocha Moa, an oxbow lake that lies a short way downstream from the lodge. The reeds, fallen trees and forested shoreline of this lake teem with birds and other wildlife. Red Howler Monkeys may peer at us through the branches of the giant trees above us, while herons lie in wait among the fallen trees, cormorant-like Anhingas watch from the forest branches, and an Osprey may circle overhead. Flocks of brilliant Red-capped Cardinals gather on dead branches, and a colorful, primitive bird, the Hoatzin, hops its ungainly way along the swampy water’s edge. In the afternoon we may travel an hour or so downriver to visit the Ese’Eja native community of Sonene, where we can meet these descendants of nomadic forest tribes, and catch a glimpse of those traditional ways of life that they manage to maintain in the modern world. We can also purchase their handcrafts, made from a wide range of seeds collected from the forest. Today we follow pathways new to us, and explore fresh areas along the lodge’s extensive network of forest trails, deepening our acquaintance with the forest and its ways, and searching for birds, mammals, and other creatures we may not yet have seen. Perhaps we will run across peccary for the first time, or add two or three species to our monkey list. Our guides will point out new species of trees and plants, explaining their medicinal, commercial or ritual uses. Towards the end of our walk we will visit one of the lodge’s several mammal clay licks, which may provide a surprise encounter with a tapir, or a Red Brocket Deer. After lunch we plunge deeper into the wilderness, boating up the Heath River into areas that are completely unpopulated, and seldom visited by anyone except an occasional park ranger, and the indigenous Ese’Eja river people. This journey is always an adventure – especially in the dry season months of June through October, when our crew may frequently have to push the canoe across sandbanks and gravel shallows. Wildlife spotting from the canoe is comfortable, effortless and productive, as many birds and animals patrol the river banks, and not infrequently swim across the river. Along with countless bird species, we usually spot families of Capybara, the giant three-toed relative of the guinea pig, which can weighs up to 55kg./120 lbs., and is the world’s largest rodent. We are often even more successful after we reach the upper limits of canoe navigation, when we can turn the engine off for long spells and float soundlessly downriver, catching the forest wildlife unawares. 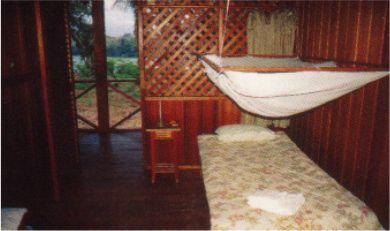 Tambopata National Reserve entrance fee. International or domestic airfares, airport departure taxes or visa fees, excess baggage charges, additional nights during the trip due to flight cancellations, alcoholic and non-alcoholic beverages or bottled water, snacks, insurance of any kind, laundry, phone calls, radio calls or messages, reconfirmation of international flights and items of personal nature.